“The Star-Crossed Lovers,” the servant read. Ana Ming sighed as her maid told the story of Cowherd and Weaving Maid, lovers doomed to separate lives. Even as she listened, Ana Ming gazed into the garden. For there another strange tale was unfolding-between her father and the foreigner. Such a contrast they were. Her father with his long queue and Manchu robes, the British merchant with his black beard and crisp suit. Yet they spoke a common language: Chinese silk for British cotton. Now the men bowed. “It is a pleasure doing business with you,” the Englishman said. “When I return next year…” Then he caught sight of Ana Ming and his words died away. Robed in a shimmering golden brocade dress, topped by an exquisitely trimmed jacket, she was the loveliest of all flowers in this loveliest of gardens. For one long moment they shared each other's gaze. Then Ana Ming raised her fan and retreated into the shadows. “And so the lovers were separated for all time,” her maid continued. 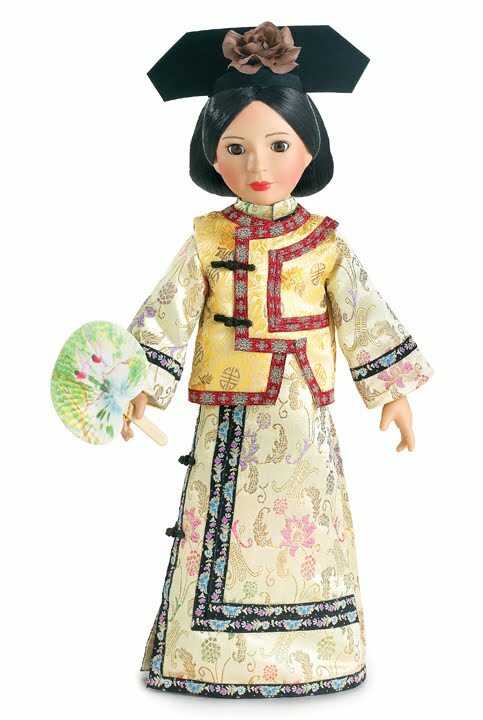 “Except for once a year, when the Milky Way reunites them.” In a whisper, Ana Ming echoed, “ 'When I return next year…' ”"
Ana Ming Dolls available HERE.